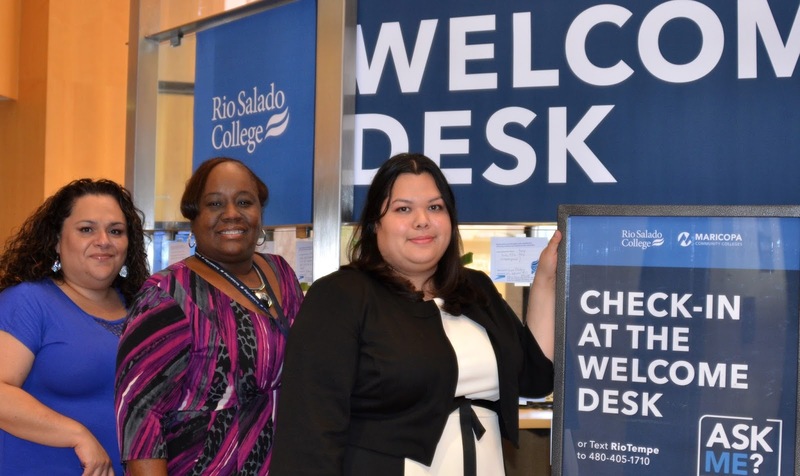 Here's to the hard-working students, faculty and staff who are the driving force of Rio Salado College! Enjoy your Labor Day weekend! Rio Salado will be closed Monday, Sept. 5 in celebration of Labor Day. Services normally available 24/7 such as RioLearn, Technology Support Helpdesk, Ask a Librarian and My.Maricopa.edu will remain available. Learn about the historical significance of Labor Day from the Department of Labor. There's still time to cast your vote in the Arizona Primary Election. 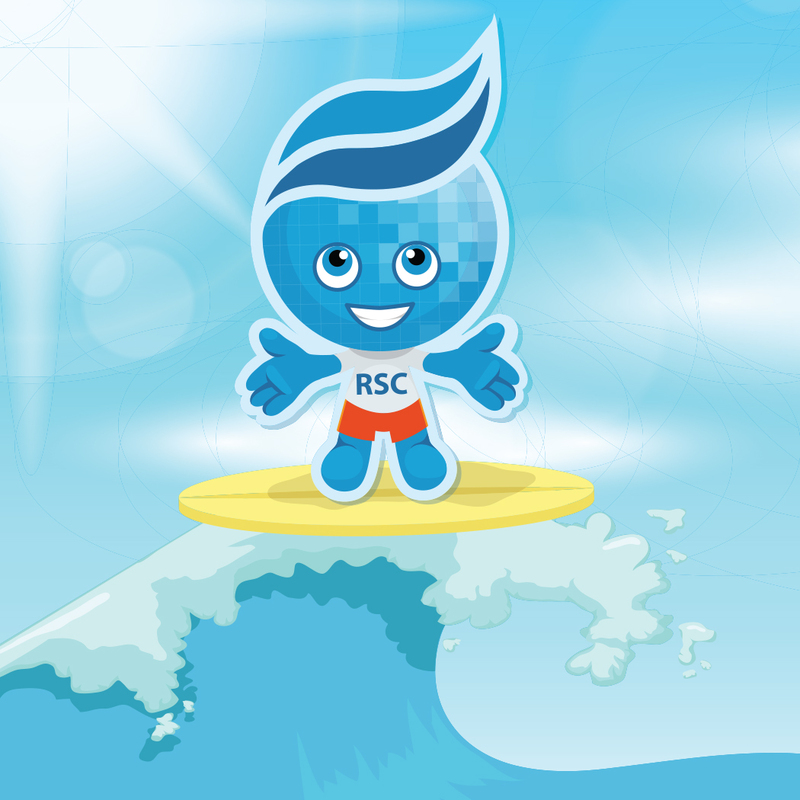 Polls close at 7 p.m.
Rio Waves Success Tip: Build Relationships! 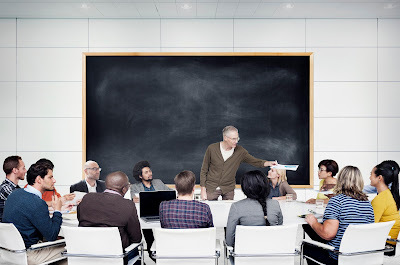 Get to know your professors and connect with your peers. Rio Salado Welcomes Two New Faculty Chairs! Welcome to Gina Pinch and Julie Cober, Rio Salado College’s two newest faculty chairs! Gina Pinch is the new interim faculty chair for Business, Management, Public Administration, and Corporate/Government Programs. She has been at Rio for six years, previously as an instructional designer for business, CIS, part of STEM and Library Services. She has a bachelor’s degree in business administration with an emphasis in finance. 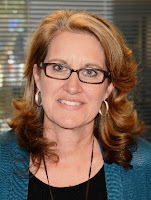 She also holds a master’s in adult education and online learning and is an alumna of Rio Salado College with certificates in public administration and e-Learning. Julie Cober is the new, interim faculty chair for Communication. She has been an adjunct faculty since 2011 and the COM discipline lead for more than two years. Julie has a B.A. in communication from Arizona State University and a M.S. in Leadership from Grand Canyon University (GCU). She is also currently working on a doctorate in Organizational Leadership also from GCU. 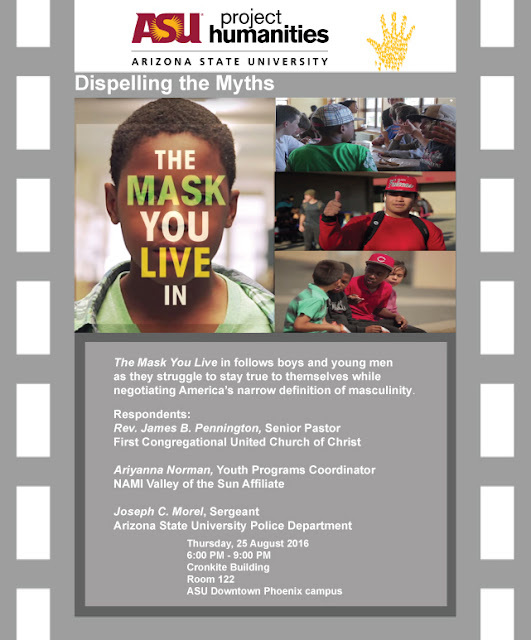 Join Arizona State University's Project Humanities for a screening and discussion of, The Mask You Live In, a documentary film that follows boys and young men as they struggle to stay true to themselves while negotiating America's narrow definition of masculinity. Project Humanities brings together individuals and communities, within and around ASU, to instill passion and knowledge of humanities study, research, and humanist thought. By exploring shared ideas and experiences, Project Humanities facilitates conversations across diverse communities to build understanding through talking, listening, and connecting. 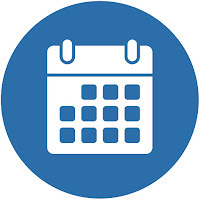 Create a semester calendar to record due dates for all exams, quizzes, papers, and finals. Plan to study! 1 hour of class time = 2 hours of study time. Plan to succeed: prioritize your time and stay informed. 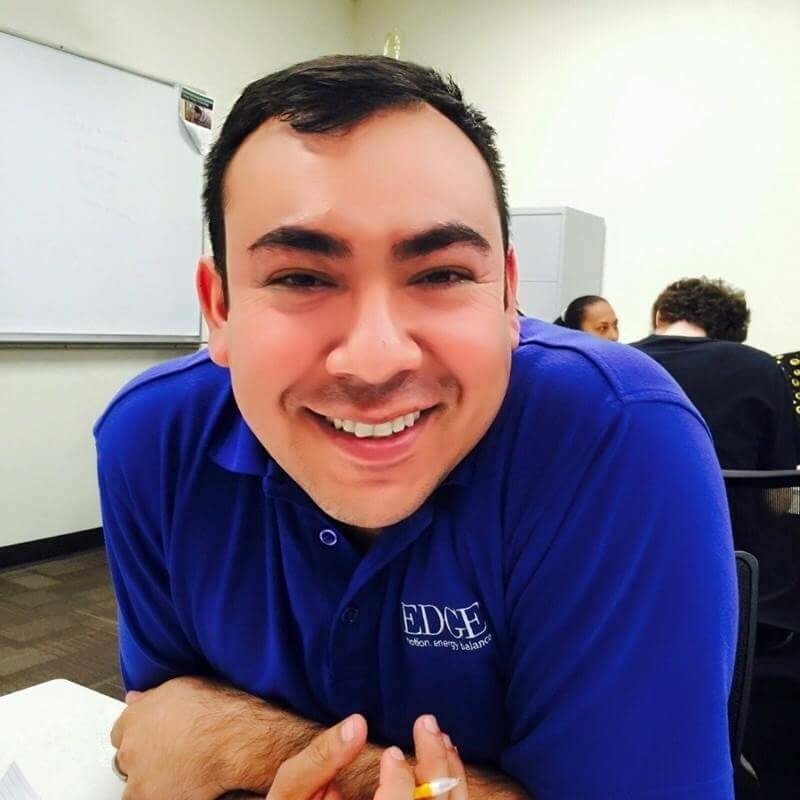 Meet Carlos Nuñez, a successful student who has benefited from Rio Salado's Adults Achieving a College Education (AACE) program, which helped him transition into college. "The AACE Program has given me strength, determination, and much knowledge to move forward in my education," said Nuñez. "This incredible experience is highly recommended to everybody interested in success. The only thing you can lose is your lack of knowledge." Are you interested in college and ready to commit to completing a degree, certificate, or a workforce training? Whether you need assistance preparing for the GED® test, learning English as a second language, finding financial aid or meeting any of the other challenges of returning to school-- we're ready to help. Visit this web page to learn how we can help you. 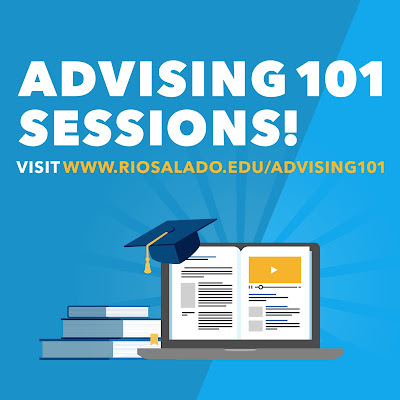 Rio Salado will offer Advising 101 group webinar sessions, Monday, Aug. 22 and Thursday, Aug. 25. 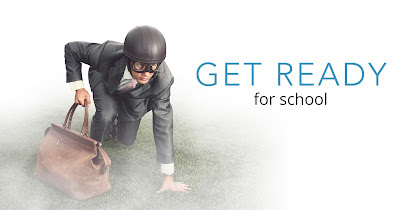 ● Work with an advisor to reach their educational goals. ● Choose appropriate classes and programs. ● Apply prior college classes to their program. ● Transfer credits to a university program. ● Find resources and tips to help them succeed. 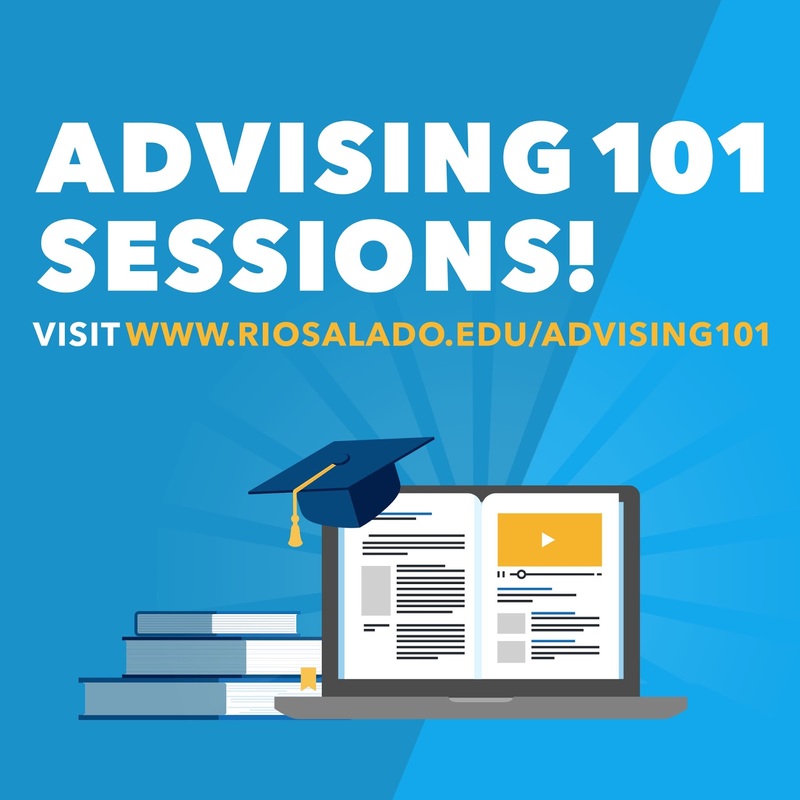 Visit www.riosalado.edu/advising101 for the latest details about Advising 101 sessions and to join the webinars. 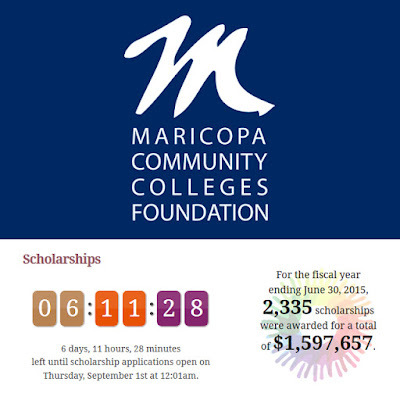 Sessions are free and open to all Maricopa Community Colleges students. 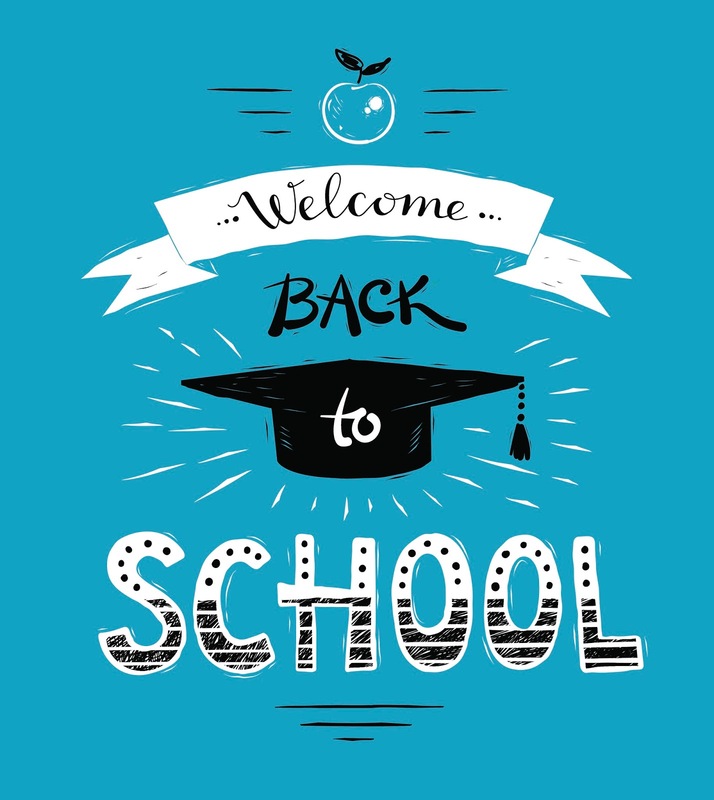 As a reminder, the Rio Salado Tempe headquarters will be open Saturday, Aug. 20, 10 a.m. – 2 p.m. to help students during the back-to-school rush. Try our new QLess service to schedule appointments. Avoid the lunchtime rush between 11:30 a.m. – 1:30 p.m. and try to call before 10 a.m. You can always leave a message requesting a callback. Avoid calling or coming in on Mondays and consider a mid-week visit. Come prepared before you call or schedule a visit by creating a "to do" list. 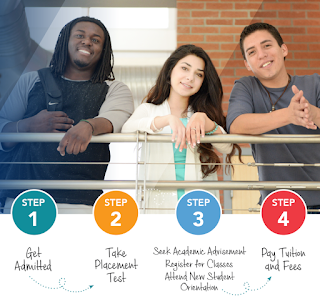 For a step-by-step guide on getting started at Rio Salado College visit www.startatrio.com. Here's to an awesome fall 2016 semester! Go #RioWaves! 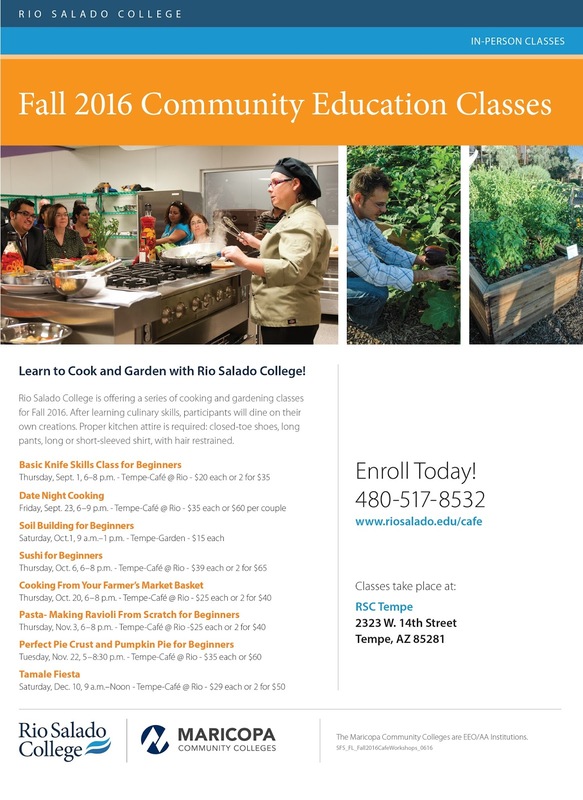 Get in-person cooking and gardening lessons from the Café at Rio chefs and Sustainable Food Systems team by taking part in Rio Salado's fall 2016 Community Cooking & Gardening Workshops. Your first lesson begins with Basic Knife Skills, Sept. 9. Enroll now by calling 480-517-8532. 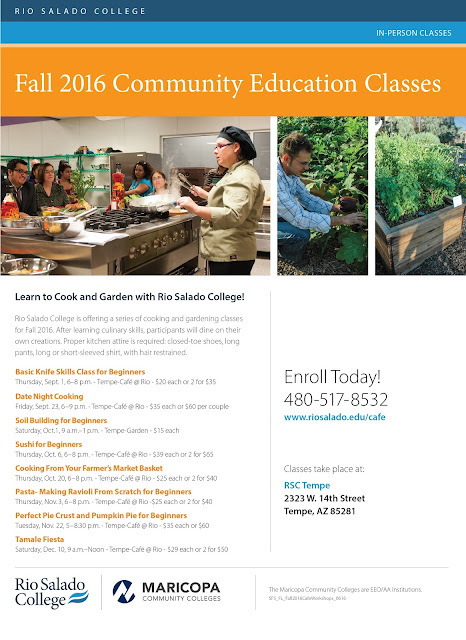 Workshops will take place at the Café at Rio and the Garden at Rio at the Rio Salado headquarters in Tempe. 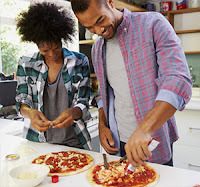 No tests, no grades-- just good old fashion fun in the kitchen! 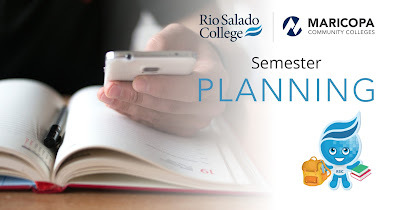 Get the latest details about upcoming events by visiting www.riosalado.edu/cafe. This class is designed for beginners and those of you who want to brush up on your skills. Demystify terms like dice, brunoise, julienne and mince. 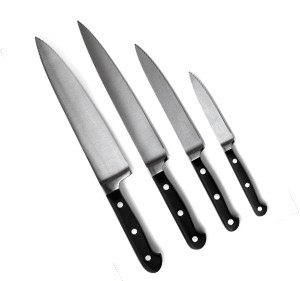 Learn pointers for sharpening knives and keeping them sharp. You'll take everything you learned to whip together a few evening snacks for the group to enjoy! Tired of your clay soil? Do your plants die every summer? Not sure when or how much to fertilize? 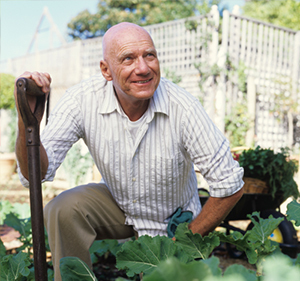 This workshop will teach you how soil forms naturally and how you can facilitate the process. You'll learn about the benefits of microbes and how to employ no-till techniques to turn your hard clay into rich, loamy earth-- and how nature works in the process. 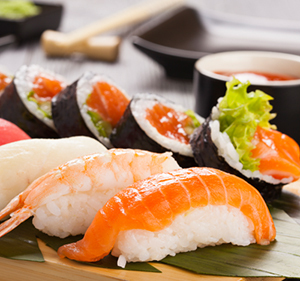 This class is designed to teach you about essential sushi ingredients; how to properly steam and season sushi rice; how to roll a basic sushi roll, inside out roll and hand roll; how to make classic sushi rolls such as spicy tuna, California roll and vegetarian rolls-- and how to eat them! 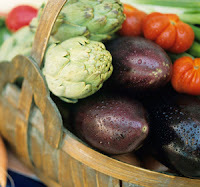 The Valley's farmers' markets provide a plethora of fresh vegetables and other goodies throughout the year. Not sure how to cook greens, squash, beets and other fall/winter vegetables from the market? This class will help you create a custom menu using ingredients from your local market. Demystify ravioli making. 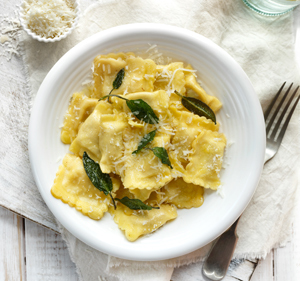 This workshop will start with a chef's demonstration on how to make fresh pasta dough. 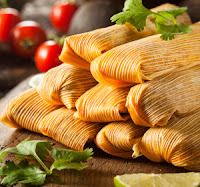 You and other participants will help roll the dough into long sheets and stuff with various fillings, learn how to trim, cook and garnish your dishes with special sauces and ingredients and then enjoy the fruits of your labor. 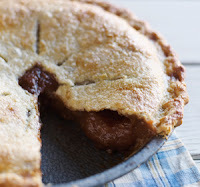 Tired of ready-made pies and pie shells? This class will teach you the tricks of the trade-- with hands on experience making your own pie, which you can take home to enjoy during the Thanksgiving holiday. You'll learn how to make the dough and a scrumptious pumpkin pie filling and how to ensure a perfectly baked pie. Work with a professional chef to make green chile chicken and red chile pork tamales. This is a hands-on cooking class that includes a chef demonstration and a chance for you to enjoy your creations for lunch. Proper kitchen attire is required including close toed shoes, long pants, long or short sleeve shirts and hair restraints. Looking for employment and workforce experience? We can help. Join Rio Salado's Financial Aid team to learn about Federal Work Study (FWS) opportunities and benefits, Aug. 23-25, 10 a.m. – 3 p.m. at the Tempe headquarters. Staff will be available to share insights about current openings, the application process and some of the financial benefits that are available to students who choose to take on a FWS position. They will have an information booth near the front lobby on the first floor of the Tower at Rio. 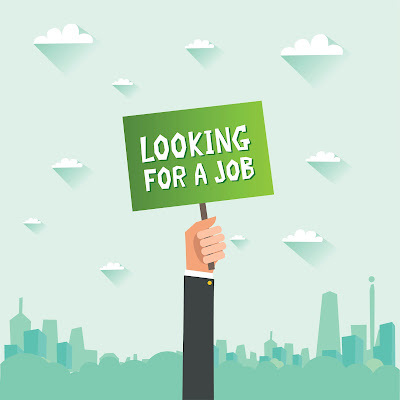 In the meantime, visit this job page to view current openings. We hope you will consider taking advantage of this program and joining Rio Salado's team! 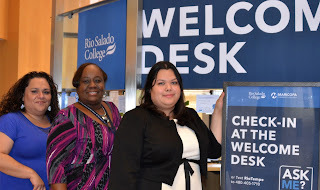 Photo: Rio Salado Financial Aid specialists Maribel Carlos, Traneice Bradley and Maria Gomes Ruelas will be among the staff available to help you apply. New to Rio Salado and the Maricopa Community Colleges? 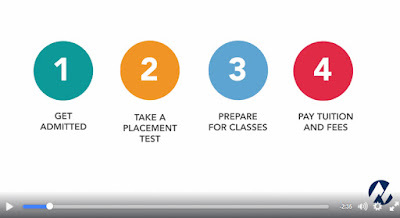 Check out this video to learn about our four-step enrollment process. 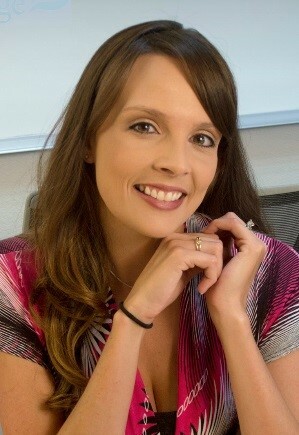 Visit my.maricopa.edu/getting-started and www.startatrio.com for additional details. 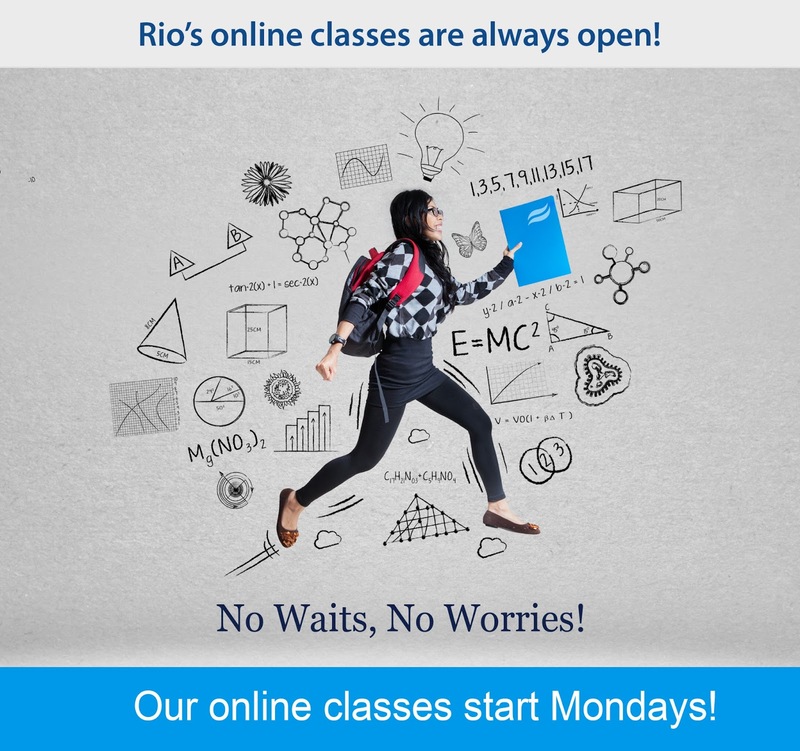 Rio Salado online classes start Mondays! 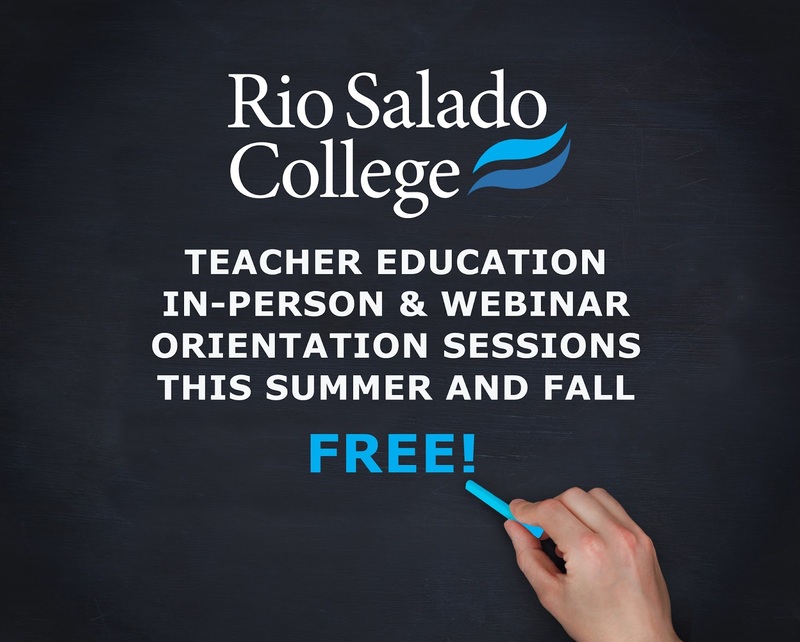 Join Rio Salado's Teacher Education team for a free orientation session-- in-person or via the web this summer and fall! Post Baccalaureate programs are designed for individuals who have a bachelor’s degree or higher (in any area) from an accredited university and would like to become a teacher. The next set of in-person orientation sessions will take place at the Rio Salado Tempe headquarters September 6 and October 24 and at the Communiversity at Queen Creek August 22 and September 26. 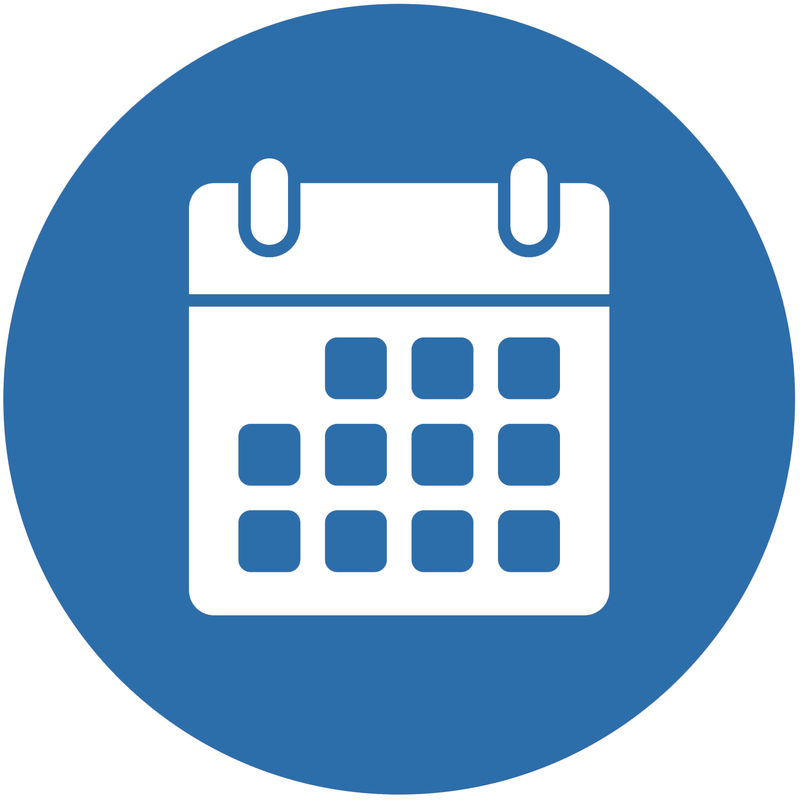 The next webinar orientation will take place November 21. Visit this program web page or call 480-517-8140 for the latest details about orientation sessions. Summer Hours End This Week! As a reminder, most Rio Salado locations and services are closed Fridays during the summer. We will resume regular hours next week! Please also take note of our blog post about special, Saturday service hours Aug. 13 and 20. 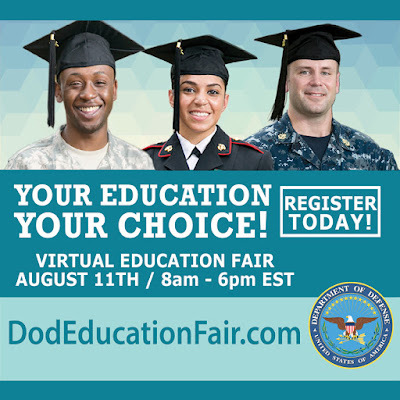 DoD Virtual Education Fair Aug. 11! Rio Salado College is taking part in a special online college fair for military members, veterans, and family members hosted by the U.S. Department of Defense (DoD), August 11, 9 a.m. - 4 p.m. Arizona time. 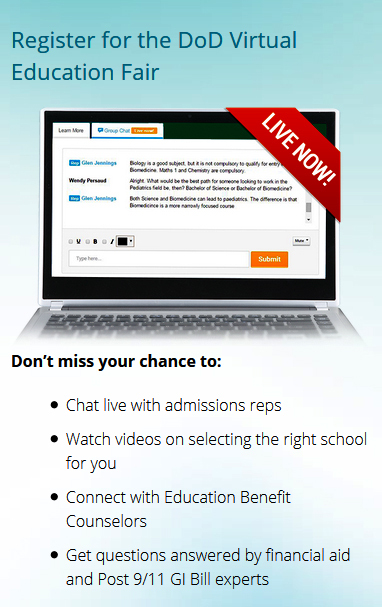 Our admissions team will be chatting live to answer questions! We hope you'll join us for this DoD Virtual Education Fair to learn about all of the programs and services we provide to military members and their families-- and how we can help you with enrollment, advisement financial aid and more. Participant registration is required and open throughout the event. 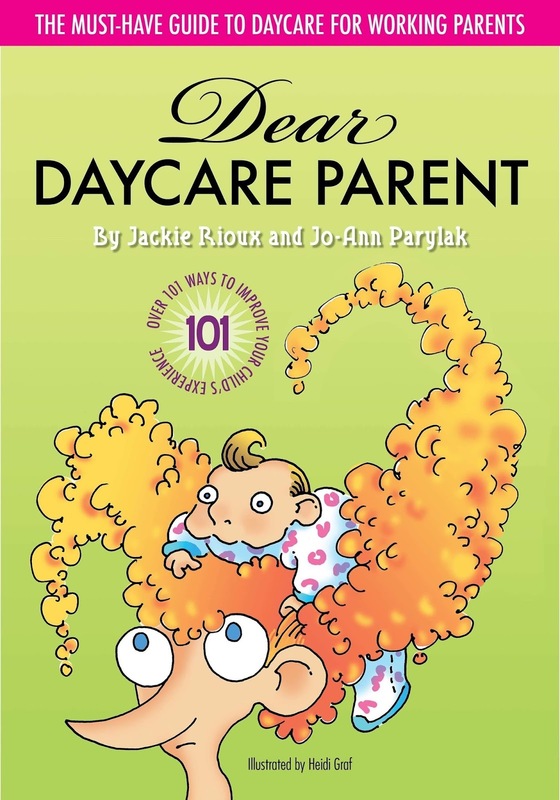 For more details, visit www.dodeducationfair.com. Participants are encouraged to use their mobile devices, if unable to access the event on government computers. 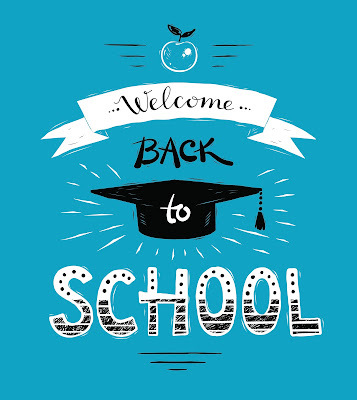 The Rio Salado Tempe headquarters will be open Saturday, Aug. 13 and 20, 10 a.m. – 2 p.m. to help students during the back-to-school rush. As a reminder, most Rio Salado locations and services are closed on Fridays during the summer. We will resume regular hours beginning August 15. Visit this web page for more details about important dates, closures and extended service hours. 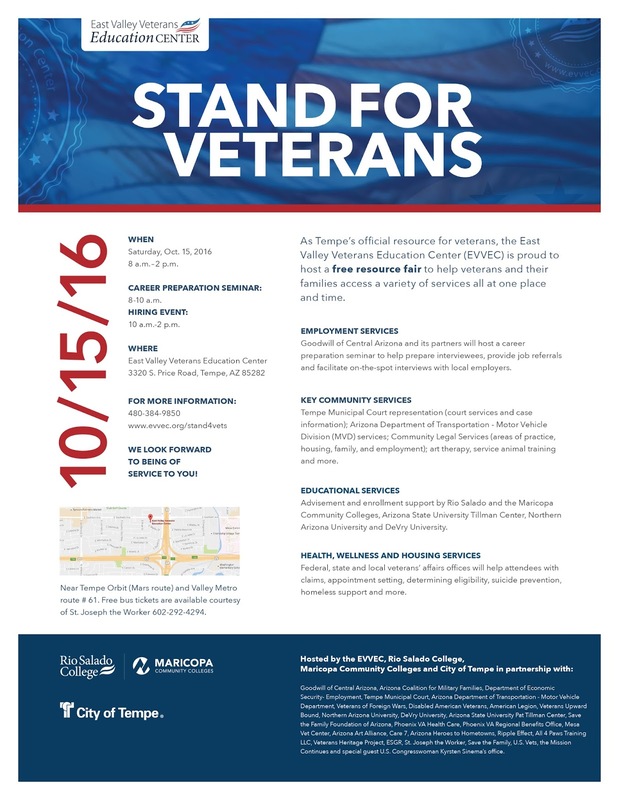 As Tempe’s ofﬁcial resource for veterans, the East Valley Veterans Education Center (EVVEC) is proud to host Stand for Veterans, a free resource fair designed to help veterans and their families access employment, education, wellness, legal services and more — all at one place and time— through an integrated network of community partners that will be on site to provide direct support. Goodwill of Central Arizona and its partners will host a career preparation seminar to help prepare interviewees, provide job referrals and facilitate on-the-spot interviews with local employers. 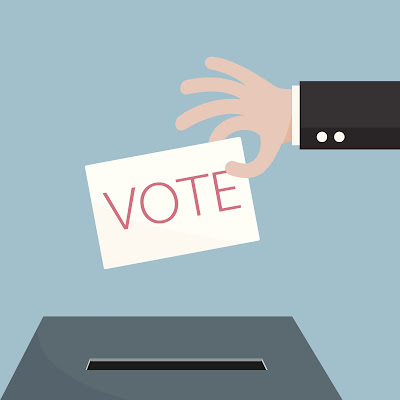 Tempe Municipal Court representation (court services and case information); Arizona Department of Transportation - Motor Vehicle Division (MVD) services; Community Legal Services (areas of practice, housing, family, and employment); art therapy, service animal training and more. 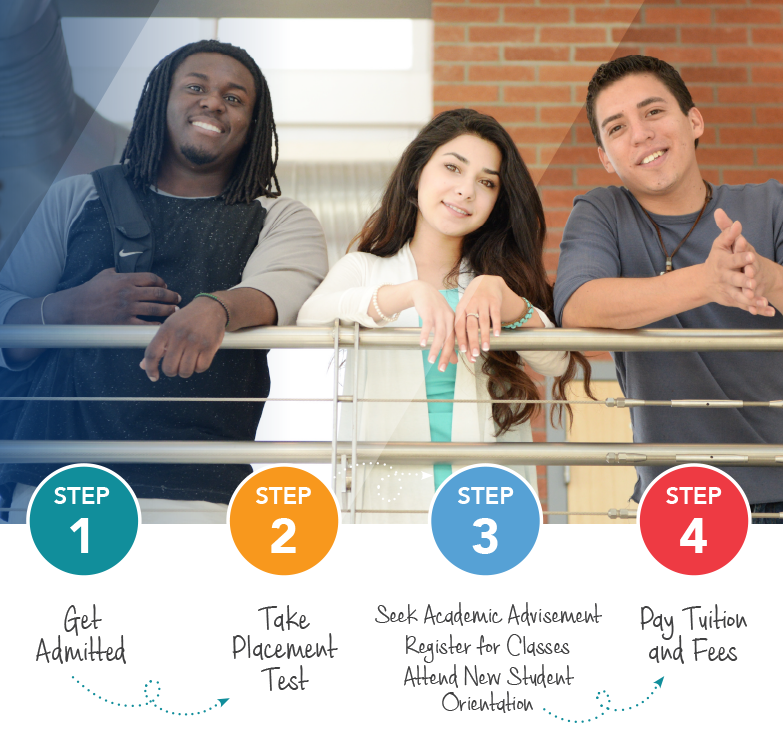 Advisement and enrollment support by Rio Salado and the Maricopa Community Colleges, Arizona State University Tillman Center, Northern Arizona University and DeVry University. Federal, state and local veterans’ affairs ofﬁces will help attendees with claims, appointment setting, determining eligibility, suicide prevention, homeless support and more. Help us spread the word by sharing this event flier. 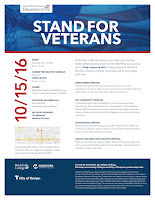 Hosted by the EVVEC, Rio Salado College, Maricopa Community Colleges and City of Tempe. Explore Teaching Workshop Aug 6! 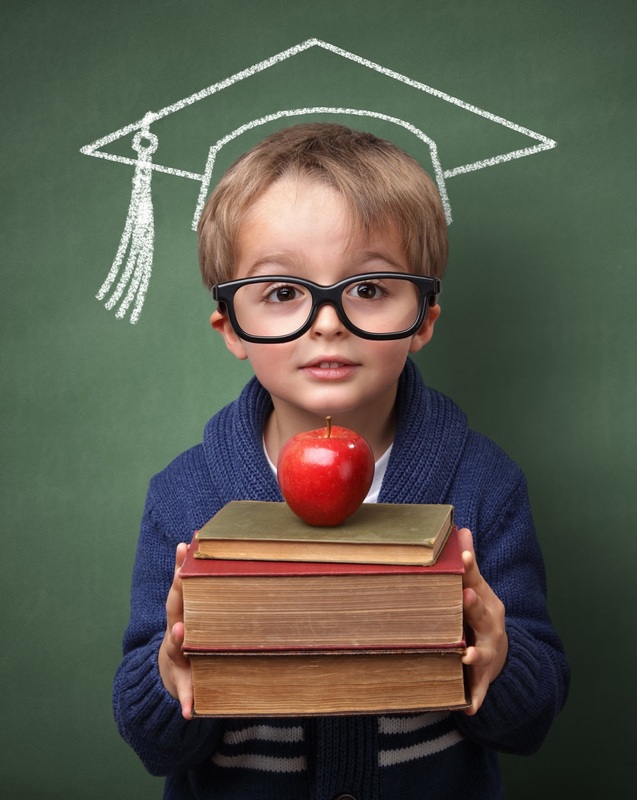 Have you ever considered a career in teaching? 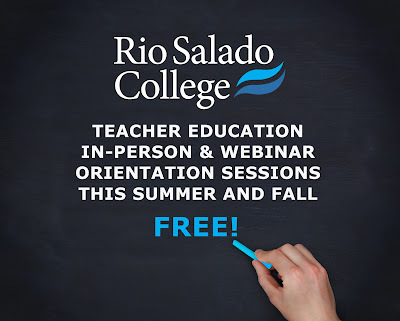 If so, Rio Salado's Teacher Education team is offering a free Explore Teaching Workshop on Saturday, Aug. 6 from 8 a.m. – 1 p.m. at the Rio Salado Conference Center. The workshop is designed for undergraduate students as well as career professionals who are transitioning to become teachers. The workshop will address many of the concerns of potential teachers before they fully commit to a certification program and a career in education. For more information call 480-517-8140. 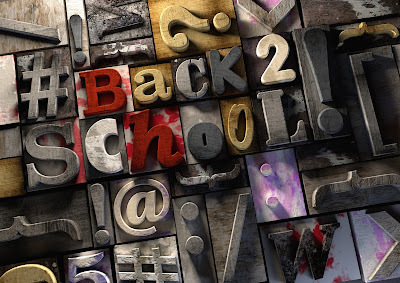 See related blog about the pressing need for teachers in Arizona. Discounted Dental Services to Help You & Students! Help support community college dental hygiene students by scheduling your dental exam and cleaning now. 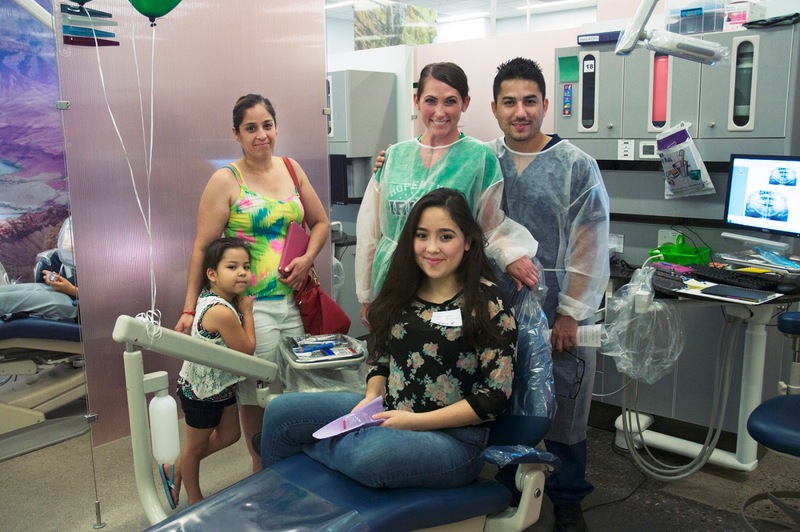 The Rio Salado Dental Clinic provides quality preventive dental hygiene services at discounted rates for MCCCD employees and the public-- while giving students practical educational experience. Fees start at $25-35 for comprehensive services which include: blood pressure screening, oral exam, X-rays, cleaning and polishing, fluoride application, gum disease screening, oral hygiene instruction, and other selected services, including sealants and dietary counseling. 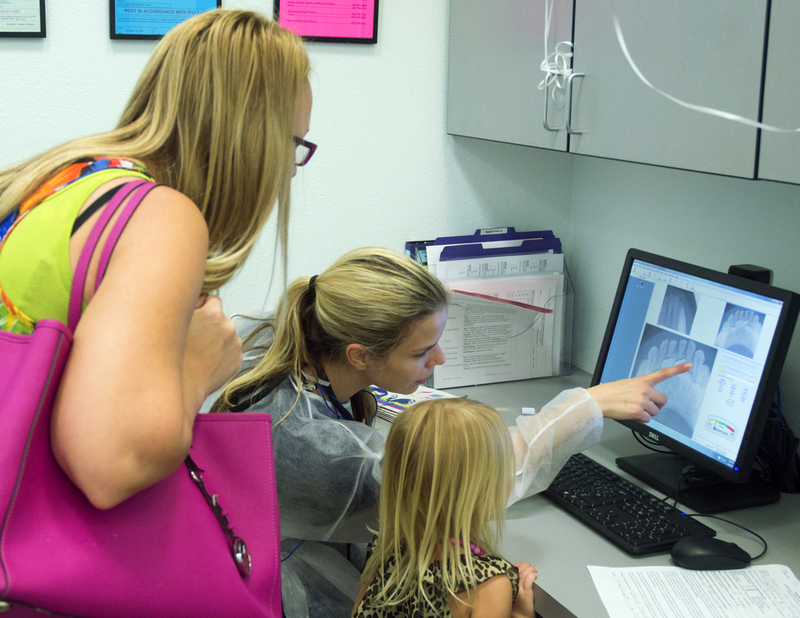 To schedule a screening appointment, call (480) 377-4100. Visit this web page for more details. 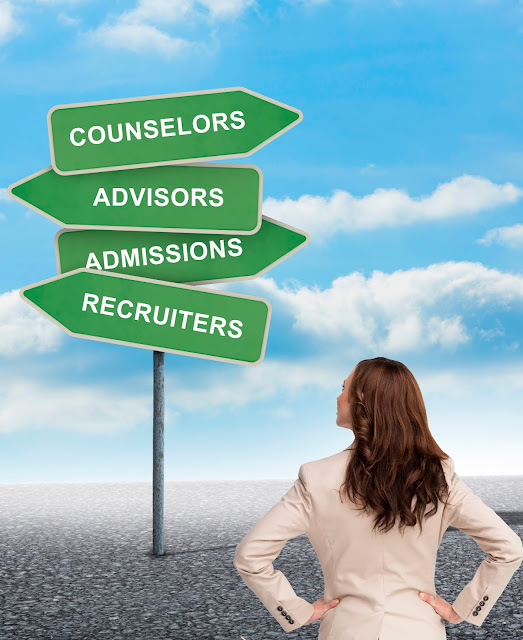 Not sure whether you need to see an advisor or counselor? You're not alone. This subject comes up quite a bit. 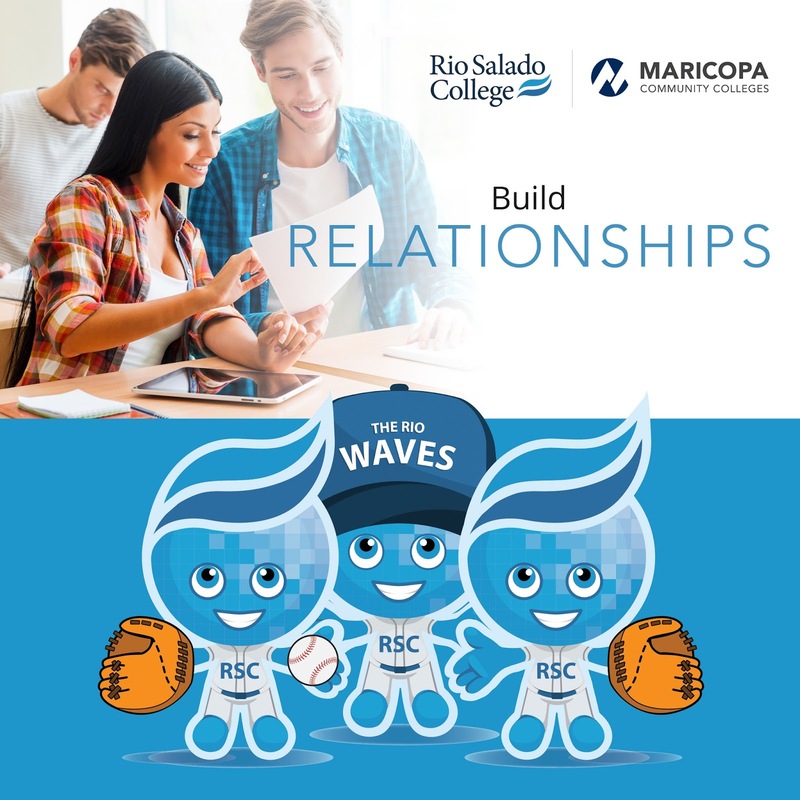 Rio Salado Counselor Elena Matus McDonald provides a distinction between the two in this RioNews blog. Have you ever heard a student refer to a recruiter, financial aid technician, admissions & records specialist, or academic advisor as a counselor? The answer is likely yes. The term counselor is often inaccurately used by many to refer to various roles in higher education and can create confusion and frustration. One of the most common misconceptions is the difference between a counselor and academic advisor. While academic advisors and counselors work closely together, they fulfill different roles for students, staff, faculty, and administration. An academic advisor’s position is multifaceted, as advisors assist students with many crucial questions. On the other hand, a counselor’s role is also multidimensional, and relates to educational planning, yet, in a different way. Here is a table to help clarify some of the distinguishing duties of these important roles. It is recommended and encouraged that students seek academic advising and career counseling throughout their college journey to increase the momentum needed to reach professional goals, as well as to begin building a solid, supportive, and reliable team to facilitate the guidance needed to graduate with a college degree. Be sure to visit Rio Salado’s Counseling and Career Services and Academic Advisement web pages for additional details on how to connect with specialists to help you with your educational and career goals. Contributed by Rio Salado Counselor Elena Matus McDonald on behalf of Rio Salado's Counseling Services, helping students with their personal, educational and career goals.